Trade wars do not make people prosperous or countries great. Indeed, as Frederick Marks explains in this guest post, trade wars were a principal factor in making the depression of the 1930s a Great Depression, and helping set off the very-much-not-great World War II. The current US President has imposed tariffs on imported steel and aluminium effective March 23, 2018 and proposes more tariffs on products imported from China. He has also proposed revoking US participation in the North American Free Trade Agreement (NAFTA) which has enabled a large expansion of trade between the U.S., Canada and Mexico. 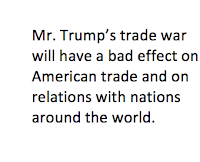 Mr. Trump’s trade war will have a bad effect on American trade and on relations with nations around the world, including Canada, Mexico, China and other Asian nations whose companies do business in the U.S., and European nations. The impact of a trade war started by the U.S. is likely to go far beyond a downturn in business for American companies. Trade wars cause depression. Trade wars cause shooting wars. 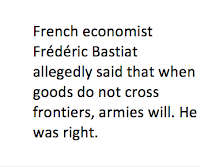 French economist Frédéric Bastiat (1801-1850) is often quoted as saying that when goods do not cross frontiers, armies will. Whether he said it or not, it's right. Trade wars were a principal factor in causing the Great Depression of the 1930s and World War II. In 1922 and again in 1930 the U.S. Congress enacted tariffs designed to protect American industries from foreign competition. The 1922 tariff law caused a depression in American agriculture. At the time, farm products were the largest category of export goods produced in America. Tariffs on foreign goods resulted in a marked reduction of foreign purchases of American farm products. How so? In this way. For people of another nation to purchase American products of any kind, they must earn U.S. dollars by selling their own goods to Americans. The 1922 tariff reduced the amount of U.S. dollars earned by people outside the U.S. Therefore, they had fewer dollars to spend. They cut back on buying farm products and other goods in the U.S.
Consequently, American farmers suffered a big reduction in export sales. They could not sell all their production domestically. So farmers cut back on their own spending. That hurt the rest of the U.S. economy because, in comparison to the present, in the 1920s and 1930s a much larger portion of Americans lived in rural communities. In 1930 the Congress enacted a more far-reaching regime of high tariffs on foreign imports. At the time the world economy had started into depression. The tariffs made the depression far worse. Other countries that exported to the U.S. imposed retaliatory tariffs on U.S. goods. Many countries imposed heavy tariffs on all imports, whatever the source. The tariffs and retaliatory tariffs were a trade war. The trade war exacerbated the global depression, which caused economies around the world to shrink, causing business failures and throwing people out of work. By 1932 the entire world had been in a deepening depression for two years or more, with no sign of things getting better. Germany was among the nations hardest hit by the tariffs, due to the burden of war reparations from World War I, and the nature of the highly industrialised German economy. France, Britain and the U.S. were the natural market for Germany’s high quality industrial products, because absent the high tariffs on imports from Germany, those countries were wealthy enough to afford German machinery and other industrial products. The 1930 U.S. tariff law had the effect of closing the U.S. market to Germany. 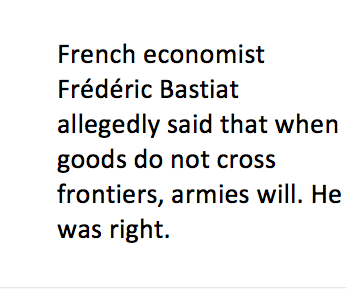 Tariffs in France and Britain had a similar effect, closing those markets to imports from Germany. By 1932 the depression had hurt the German people badly. The economic walls against Germany added to the woes that Germans had suffered due to an extreme hyper-inflation in the early 1920s that wiped out the savings of the middle class in Germany. Germany’s economic catastrophe played into the hands of Adolf Hitler (1889-1945) and his National Socialist German Workers (Nazi) Party. From 1920 to early 1933 Germany was governed by political democracy. At first the Nazi party was only a marginal, fringe party, albeit a noisy and violent one. The Nazi party garnered only a relatively small number of votes in every election until 1932. In that year, the Nazis received a plurality, but not a majority of votes. In January 1933 Hitler used that plurality to persuade Germany’s senile President, Paul von Hindenburg (1847-1934), to appoint him Chancellor. It took Hitler only two months thereafter to dissolve the German republic and become dictator and absolute master of Germany. Hitler and his Nazi party turned Germany into a militaristic police state. 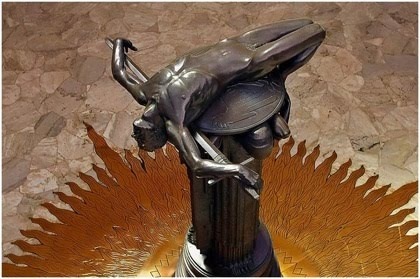 Hitler was bent on conquest of France, in revenge for military defeats in WW I. He was also bent on conquest of the Slavic peoples east of Germany (Russia, Poland, and more), whom he intended to enslave and eliminate by starvation so that Germans could occupy the lands of the Slavs. Between 1938 and 1942 Nazi German armies invaded or took over without a fight most of the nations from France to Russia (then known as the Soviet Union). Hitler’s Nazi Germany was defeated only after a terrible war that caused the deaths of seven million Germans, over twenty million Slavs (mainly in the Soviet Union) and millions more in other European nations killed in war or by the Nazis’ deliberate extermination of civilian populations. What can be done to avoid a trade war initiated by Mr. Trump? It would take resolute action by the U.S. Congress. 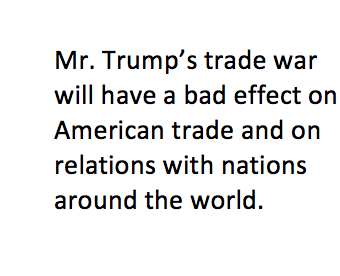 Mr. Trump is imposing his trade war by means of Executive Order. This he is empowered to do by U.S. laws. The Congress could however repeal those laws and once those laws are repealed Congress could countermand Mr. Trump’s Executive Orders. However Mr. Trump has the veto power of the Presidency. It would take a two-thirds vote in each house of Congress to override a veto. Where is the courage of anyone in Congress to oppose Trump’s trade war in ways that could put it to an end? No one in Congress is speaking up. The failure of a democracy comes about in this way. A legislature enacts unwise laws. A President uses them to do bad things. And no one in politics has the will or courage to do anything about it. Frederick Marks has taught investments and financial planning at UCLA, was a student of Andrew J. Galambos, and has been active as an investment counsellor. In his book 'Capitalism: The Liberal Revolution' Mr. Marks shares what he learned from Andrew Galambos and what he has understood through his own study. His article has previously appeared at FEE, and at his website Capitalism: The Liberal Revolution.